On the bus to Boston, I feel free. It’s just me, a book of essays, and my iPhone. No diaper bags. No little feet trailing me into the narrow, dark bus bathroom. I sit and listen to the breathing meditation from the mindfulness class I just started. I breathe in. I breathe out. In between, my mind bounces. Worry about the flight I’m about to take—my first since having children. The echo of my son’s pleas the night before for me to stay: “Mama, please don’t go. Mama, please don’t go. Mama, please don’t go.” He said it like a chant, and it cracked my heart. But I still went. This will be my second weekend away since my son was born five and a half years ago. It will be the furthest I’ve travelled from my kids. The plane will whisk me over the clouds, airborne. Meanwhile my kids play at preschool—safely, I pray—cradled by sweet ground. Before I had children, I built a routine full of self-care. Therapy, acupuncture, 12-step meetings, yoga, and other exercise were regularly kept appointments. Sleep and rest were plentiful, unbroken. I called on my supportive partner or friends when I needed to hash something out. Sometimes I wondered why I needed so much care when it seemed like many, if not most people, cruised through lives stuffed full of work and commitments and little time for nurturing themselves. Eventually, I realized it didn’t really matter if I needed more or less than others—infusing my life with these breaks decidedly eased my struggles with anxiety, depression and food addiction issues. Oh, I had planned to continue my self-care as a mom. I’d spoken with my husband about it at length, and we both resolved to not drop the things that brought us peace and joy. I even planned for post-partum depression. 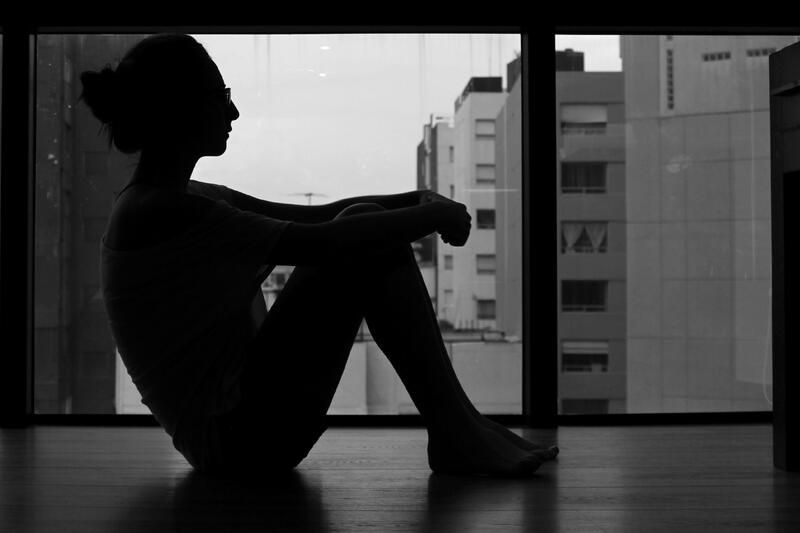 However, I know now that you can’t truly plan for submerging into depression and anxiety while also suddenly being responsible for a very new – and in the case of my firstborn, a rather unhappy—life. I hadn’t planned for a son only soothed by nursing – every 45 minutes. I hadn’t planned for months upon months of shattered sleep. And I hadn’t planned for the whisperings about the benefits Attachment Parenting to braid into my bruised brain, which left me feeling that my son’s needs were much more important than my own. In those first post-partum weeks, I had lows that I didn’t really tell anyone about. At night, I fantasized about being hospitalized so I could sleep and be alone. Intrusive thoughts about hurting my son careened through my cracked mind. Despite my fantasies of someone else stepping in and relieving me of my miserable new duties, it didn’t take too long to figure out that I needed help. I ever so slowly began to hang the rungs to the ladder of self-care that would make life, if not good, at least bearable. I started with increasing my medication, re-starting therapy and a post-partum support group. I brought my son to both therapy and the support group, frequently holding him to my breasts to feed and sooth him. A few months later, I tried leaving my son with my husband so I could attend an occasional yoga class, feeling both guilty and elated as I backed out of the driveway, the infant car seat empty and quiet. When my son was about six months old, I rejoined the bi-monthly writing group that I’d attended for several years. I returned home that night to a screeching baby and a husband who simply said, “Get this thing away from me.” We laugh about it now, but at the time I felt defeated – my son needed me! How could I leave him with even a loving parent when he so obviously only wanted me? The following summer, when my son was a toddler, I began leaving him more often with my parents. When they left for the winter, I paid a friend to babysit him for a few hours a week so I could sleep or write or shower. When he was a few months shy of two, still nursing frequently, I enrolled him in a daycare two days a week. I was wrought with guilt over the decision—what kind of mother paid to be away from her child when she wasn’t working? But I was also exhausted, burnt out, and lost. I daydreamed about the day when he’d start kindergarten, but in those early days and years, time was sticky slow. Fast forward four years. Four years! My son will be starting kindergarten in the fall. I remember the days when kindergarten seemed impossibly far away, and now I wonder how it all blurred by so fast. My daughter, who is two-and-a-half, goes to daycare three days a week. I use the time to write, work, clean, go to appointments and take care of myself. I recently joined a hot yoga studio and began taking a meditation class. Within the last two years, I also took up running. Even with all that time—precious time that is much more than many moms get—I still feel fried a lot of the time. It’s my nature, or my nurture, or whatever—it’s part of who I am. As an introvert, as a creative person, as someone who struggles with anxiety and depression, with just being present. I am further and further away from the exhausted, depleted shell I was when I first became a mom. I have fought the guilt monster—the one that says I’m a crappy mom because I need so much time away from my kids. The one that buys into the lie that mothers want to be mothers all the time. It still rears its head from time to time. But it doesn’t stop me. Because really? 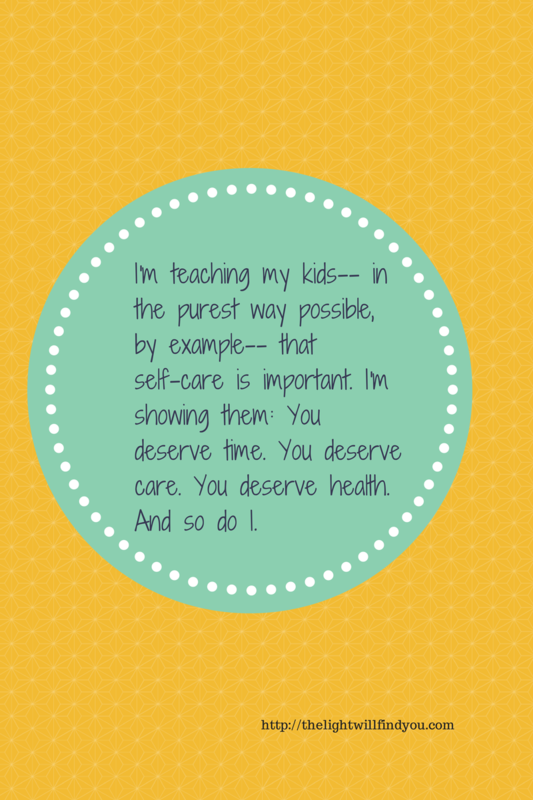 My need for self-care has little to do with the kind of mother I am and everything to do with the kind of person I am. I needed a lot of “extras” to thrive before I had children. Why would it be any different after? Why wouldn’t I need even more self-care when I’m taking care of two more little lives? Lives who need a healthy mom? 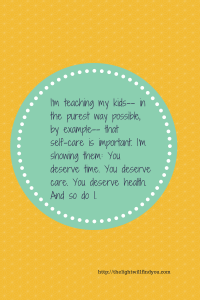 Besides benefitting my mental and physical health, I believe I’m teaching my kids—in the purest way possible, by modeling—that self-care is a priority. I can’t help but think this is a gift we’re giving them: You deserve care. You deserve time. You deserve health. The kids know that Daddy puts them to bed on Wednesdays because Mommy has meditation class, and he makes them dinner on Sundays so Mommy can go to yoga. They know that Mommy does bedtime on Tuesdays so Daddy can go to his breathing class, and on Thursdays when Daddy has golf league. They know that on the weekends, we might take turns going for a run. This time, I go further: Bus. Boston. Baltimore. For my writing, which has grown wing buds this past year, I’m treating myself to a blogging conference. For myself. Despite my intense fear of flying. Despite my worries, and despite my son’s pleas. Despite the anxiety of rooms full of clustered strangers. When I get to the conference, I meet dozens upon dozens of other moms—and one brave dad—who have also left their babies behind for a weekend. They are good parents, like me, sidling closer to their dreams. My husband sends pictures of my kids at a baseball game, smiling and pink-cheeked. When I return, they meet me at the bus station. My smile blooms as I see them waiting for me. They run up and launch their little bodies into my arms. I am happy to have gone, and I am happy to be back. My skin hums with energy, and I bring a slice of the supportive spark of the conference back with me. To my family. To my kids. To myself. We are all better for it.